We believe that buying a used vehicle is the way to go, which is why we sell used and wholesale vehicles. To help you in your search, we have created these pages to describe some of the most common models that we sell. Are you ready to hit the road, or rather, are you ready to get off the road? Jeep vehicles offer magnificent off-road capabilities, and they might even be the first vehicle to come to mind when you think of outdoorsy or athletic. They also manage to be stylish, and everyone can picture the iconic Jeep Wrangler in their head. Its bulky square frame and circular headlights create a noticeable contrast. 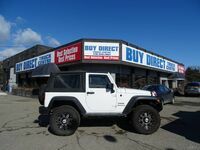 We have used Jeep Wrangler vehicles here at Buy Direct Truck Centre, and that is the model we want to focus on today. Take a look at the features of a Jeep Wrangler in the chart below and read about the benefits of buying a used Jeep Wrangler vehicle here at Buy Direct Truck Centre. The features in the chart will vary by model year, but they give you an idea of what stuff the Jeep Wrangler is built with. One of the benefits of buying with us is that we sell vehicles for below their selling MSRP. The starting MSRP of a new Jeep Wrangler is $27,945 and above that for other trim levels. Here, we have a variety of model years to choose from which creates a wide price range where any budget can comfortably find their fit. Furthermore, we have multiple colors and trim levels of used Jeep Wrangler vehicles to choose from and you can easily compare them to the competition, because we also sell the competition. Buying at Buy Direct Truck Centre means that you can do all your shopping in one place and still get a great deal. We hope to see you soon so that our professional sales team can help you search through our off-road vehicles and start your next adventure.